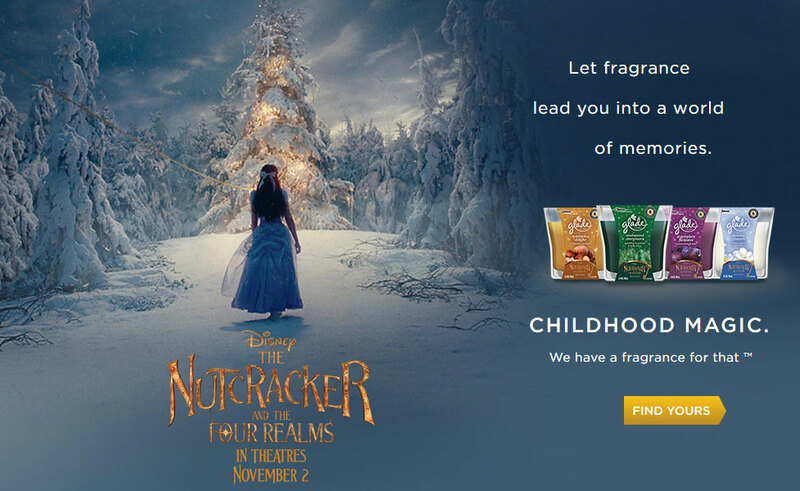 Disney the Nutcracker and the Four Realms Collection by Glade - A new home fragrance collection of candles, scented oils, and room sprays featuring scents inspired by the new Disney Nutcracker movie. 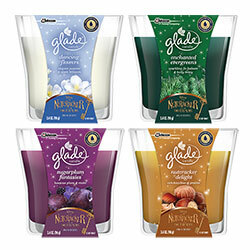 The Glade Nutcracker Collection includes four new seasonal fragrances: Dancing Flowers is a blend of elegant jasmine and apple blossoms, Enchanted Evergreens showcases sparkling fir balsam and holly berry, Nutcracker Delight mixes rich hazelnut with praline, and Sugarplum Fantasies fuses luscious plum with violet. Available in scented candles, scented oils, and room sprays to give your home a little Christmas sparkle this holiday season. 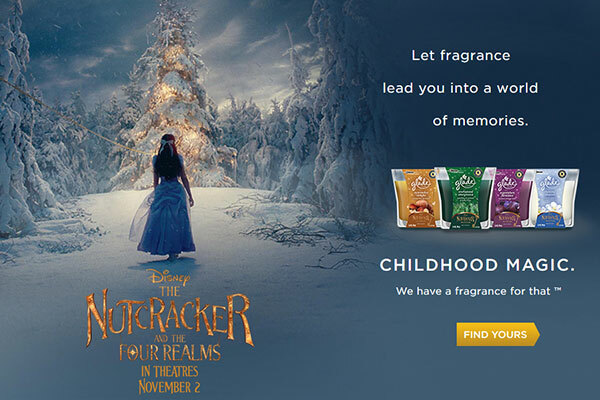 Let fragrance lead you into a world of memories. Childhood Magic. We have a fragrance for that. Bright. Mesmerizing. A sophisticated floral bouquet of exotic jasmine and petite lily of the valley dances with sparkling pear and fresh greens upon light, white woods. Gaze in wonder at the sophisticated waltz. Fill your heart with wonder as the essence of sweet jasmine twirls tenderly with rose, while notes of sparkling pear blend perfectly with mesmerizing bright apple. Hints of lily of the valley and white woods supply a base of freshness to this alluring fragrance. Sparkle. Wonder. Elegant and glistening pine needles. A touch of festive spices with notes of cinnamon bark and nutmeg. Enjoy the magic of the moment. Be enchanted by the wintertime scents of fresh pine needle and fir balsam. Hints of sugared apples and sparkling winterberries sprinkle in the natural sweetness of the season, as notes of cinnamon bark and nutmeg take you back in time. Warm. Indulgent. Swirls of roasted hazelnuts and sweet pralines. Dusted with notes of creamy vanilla bean upon dollops of almond butter. Delight in the sweetness decadence of the season. Revel in the decadence of the season with warm notes of roasted hazelnuts blended with sugary maple water. Delightful hints of sweet cinnamon and pralines swirl whimsically. Rich vanilla bean and almond butter spread feelings of delicious indulgence. Scrumptious. Mysterious. Scents of luscious dark plums and tart blackberries collide with precious violet and addictive vanilla sugar. Be spirited away by this passionate fruit medley. Get lost in the intrigue of luscious plums blended with fresh boysenberries and blackberries. Floral notes of precious violet and lily of the valley spread feelings of freshness, while addictive vanilla sugar and patchouli infuse excitement into this luxurious fragrance.